I remember watching my son struggle to get his school work done. He was trying so hard, but he just couldn’t focus. He was distracted by the birds flying around the windows, he was drumming on the table, he kept getting up to get a snack or drink water. He just could not sit still. All summer long he had spent hours outside climbing trees, swimming at the pool, and just running around being a boy. The transition to school is always a little rough for him. Having to sit still, focus, and spend less time outside takes a lot of self-control. Over the past few years and a lot of trial and error, I have found a few things that work really well to help my son be able to focus when it’s time to get down to work. The food we eat really affects our bodies and our brains. I have found that when I am focusing on filling my boys’ bellies with good whole foods instead of junk and sugar they are able to focus a lot better. Not only are they able to focus better, but as a family we just feel better when we are feeding our bodies the right things. Making sure that my boys get enough rest is very important to their ability to focus during school the following day. If they are over-tired and sleepy they just cannot focus. They are also cranky and irritable and it’s really hard for them to get through the school day. I make it a point for my boys to get to bed early so they can have the amount of rest their bodies and brains need to be at their best the next day. 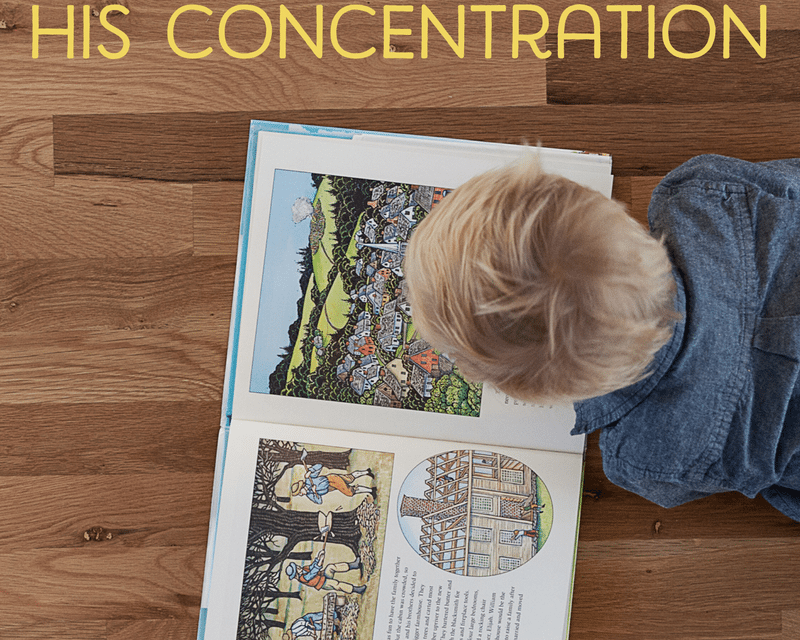 I have found that limiting screen time is also extremely helpful in improving focus and attention. For my boys I have found that the more screen time they have the less they are able to focus. Sitting still in front of the screen for a long time means all that energy comes flying out as soon as the screen go off. For us I really limit the amount of screen time they have during the day, often there’s no screen time during the school week and maybe a movie on the weekends. 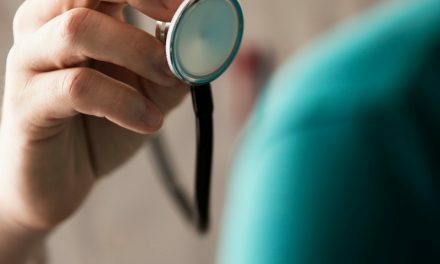 It can seem counterintuitive, but getting moving is a great way to focus and improve your concentration. I have watched my son sit at the table, drum on the table with his left hand, tap a completely different beat with his left foot, and hum a tune while working on math problems. Drives me nuts, but all of that movement seems to help him really focus. Making sure our boys have time to play in the afternoons before homework or maybe doing some jumping jacks in the morning before they head off to school helps them focus. If you homeschool, try taking a break in your day to get up and move. 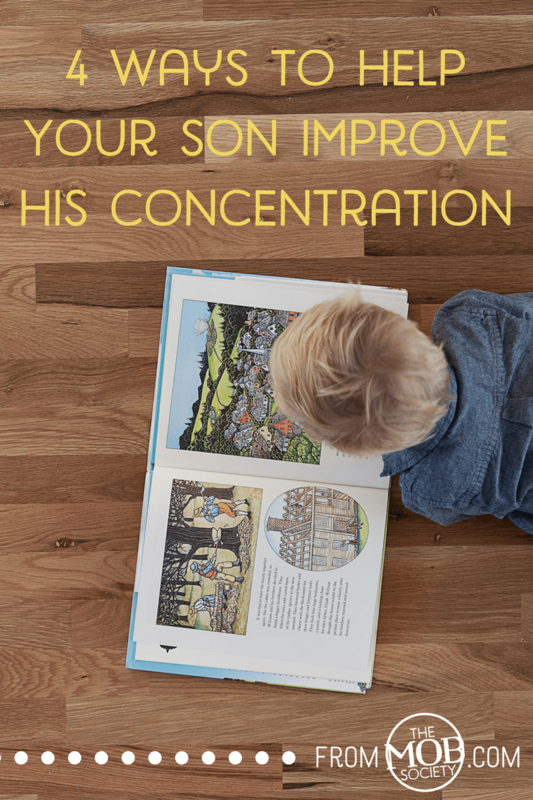 It can go a long way in helping your son focus. What are some ways that you found to help your boys concentrate on their schoolwork? Letting my son move helps. Playing outside for awhile before homework. He also likes to have something in his hand while working on schoolwork. A Lego figure, a matchbox car. Something small. I have learned that he does better work with something in his hands. Not sure why, but her does. Also if I am reading to him, he can listen just as well if he is coloring, or taking a few Legos apart and putting them back together. Doing something quietly with his hands somehow helps his concentration and learning.